The Universe Story Walk takes participants along a half-mile path through the woods to learn the 14-billion year history of the Universe. 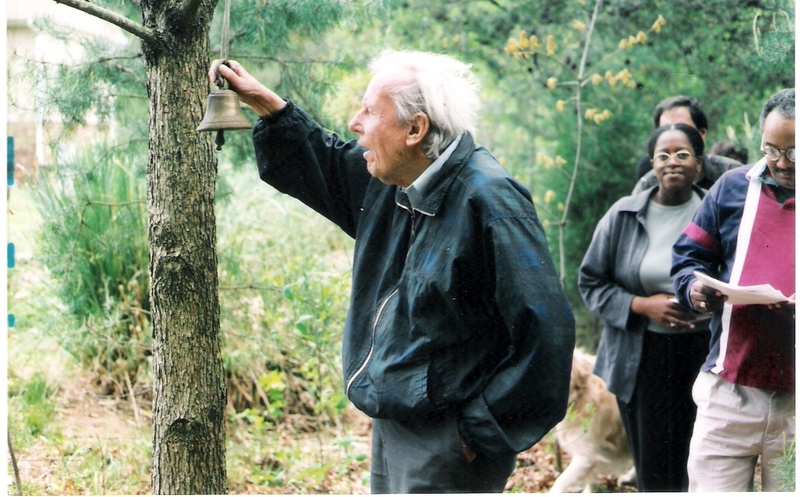 The Universe Story Walk was dedicated by Thomas Berry in 1999 (photo at right). The walk is available to individuals and groups upon request. Preview the walk on YouTube or listen to an introduction to the walk. Contact Nelson Stover for details. Greensboro’s first Permanent Universe Story Walk guides voyagers on a ½-mile gentle walk through the 5-acre upland woods on the property of Elaine and Nelson Stover, 5911 Western Trail – north of Bryan Blvd. near the Piedmont Triad International Airport. The journey begins in the pine glen adjacent to the parking pad at the south end of the 300’ gravel drive. Stepping out of the comfortable confines of the glen symbolizes the Primal Flaring Forth, the cataclysmic event some 14 billion years ago that sent matter scattering through time and space. Through a portal in a stand of tall pines just east of the glen, the Universe Story Walk heads toward the first marker. At intervals of 100 feet stand numbered markers – each interval represents 1 billion years of the Universe’s growth and development. The story continues through the birth of the hydrogen stars, and their eventual collapse. The Sun we know is born at the 9-billion year post and life begins just 100’ away. The last billion years is divided into four sections (each representing 250 million years) as the pace of change accelerates. One foot from the end of the journey, Lucy – the first human – emerges and the rest is history. Voyagers step out of the woods into the Ecozoic Era and arrive at a place suitable to reflect on their journey through time, space and consciousness. A re-useable guidebook is available so that voyagers may read a bit of the Universe’s story as they traverse the pathway. For each of the billion-year posts, voyagers will find a contextual reading that tells the Universe’s accomplishments and developments during that period. “Ponder-able Points” in the guidebook focus the voyagers’ attention on places in their own lives where they might see the great dynamics of the Universe at work. The Universe Story Walk narrative draws heavily on the work of Greensboro native Thomas Berry and his co-author Brian Swimme in their book The Universe Story, HarperCollins Publishers, 1992. The permanent Universe Story Walk at Stovers’ Séjour itself manifests the dynamics of our emergent reality. Each of the billion-year points has been marked with a simple number-bearing signpost naming the particular benchmark accomplishment of the growing universe. As creativity coalesces at these points, additional graphic representations may be presented. Woods gardens and other reflective spaces are also developing as the pathway takes on significance for those who self-consciously participate in the journey. Benches are available at three points along the way. Individuals and groups are welcome to take the Universe Story Walk at any time by calling ahead to make special arrangements. Voyagers travel at their own risk; neither Elaine or Nelson Stover, nor any other guides for the walk, are responsible in any way for any physical harm or shaken ideological foundations that may occur on the journey. 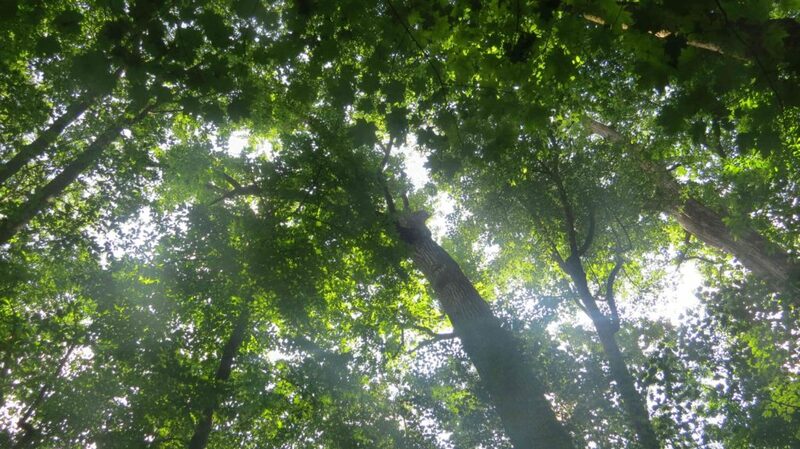 The Universe Story Walk is a program of Emerging Ecology; financial contributions are graciously accepted toward the upkeep and maintenance of the Universe Story Walk trail. You can get to the Universe Story Walk by taking the Fleming Rd. exit from Bryan Blvd. Follow Fleming Rd. around to Inman Rd. and turn left (back toward the airport). Turn right on High View Rd. and immediately turn left on to Western Trail. The Universe Walk is at the end of the long second driveway at the bottom of the hill. The Universe Walk Guidebook contains readings that have been excerpted from The Universe Story by Thomas Berry and Brian Swimme. A .pdf version is available for download. It is formatted to be printed as a booklet. Set the printer to landscape and print front and back, flip on short edge. This guidebook is provided as a service of Emerging Ecology -- kindly acknowledge its source.